A myriad of techniques and instruments exist to aid the pilot in navigation of the aircraft. An indication of direction is part of this navigation. Having an instrument on board an aircraft that indicates direction can be invaluable to the pilot. 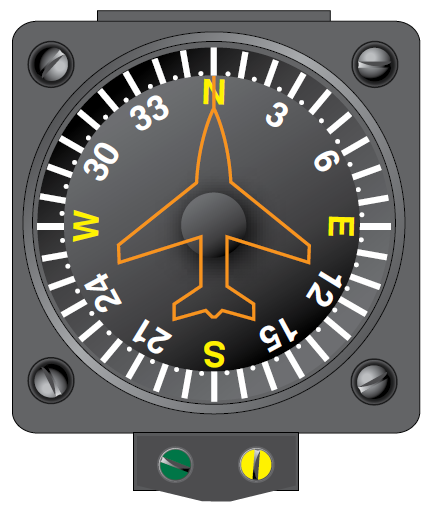 In fact, it is a requirement that all certified aircraft have some sort of magnetic direction indicator. The magnetic compass is a direction finding instrument that has been used for navigation for hundreds of years. It is a simple instrument that takes advantage of the earth’s magnetic field. Figure 1 shows the earth and the magnetic field that surrounds it. The magnetic north pole is very close to the geographic North Pole of the globe, but they are not the same. An ordinary permanent magnet that is free to do so, aligns itself with the direction of the earth’s magnetic field. Upon this principle, an instrument is constructed that the pilot can reference for directional orientation. Permanent magnets are attached under a float that is mounted on a pivot so it is free to rotate in the horizontal plane. As such, the magnets align with the earth’s magnetic field. A numerical compass card, usually graduated in 5° increments, is constructed around the perimeter of the float. It serves as the instrument dial. The entire assembly is enclosed in a sealed case that is filled with a liquid similar to kerosene. This dampens vibration and oscillation of the moving float assembly and decreases friction. On the front of the case, a glass face allows the numerical compass card to be referenced against a vertical lubber line. The magnetic heading of the aircraft is read by noting the graduation on which the lubber line falls. 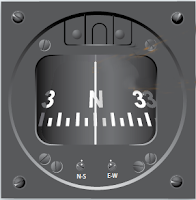 Thus, direction in any of 360° can be read off the dial as the magnetic float compass card assembly holds its alignment with magnetic north, while the aircraft changes direction. 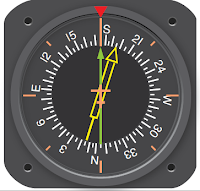 There are accuracy issues associated with using a magnetic compass. 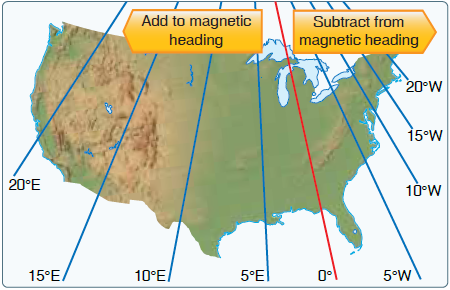 The main magnets of a compass align not only with the earth’s magnetic field, they actually align with the composite field made up of all magnetic influences around them, meaning local electromagnetic influence from metallic structures near the compass and operation aircraft’s electrical system. This is called magnetic deviation. It causes a magnet’s alignment with the earth’s magnetic field to be altered. Compensating screws are turned, which move small permanent magnets in the compass case to correct for this magnetic deviation. The two set-screws are on the face of the instrument and are labeled N-S and E-W. They position the small magnets to counterbalance the local magnetic influences acting on the main compass magnets. The process for knowing how to adjust for deviation is known as swinging the compass. It is described in the Maintenance of Instruments and Instrument Systems. Magnetic deviation cannot be overlooked. It should never be more than 10°. Using nonferrous mounting screws and shielding or twisting the wire running to the compass illuminating lamp are additional steps taken to keep deviation to a minimum. 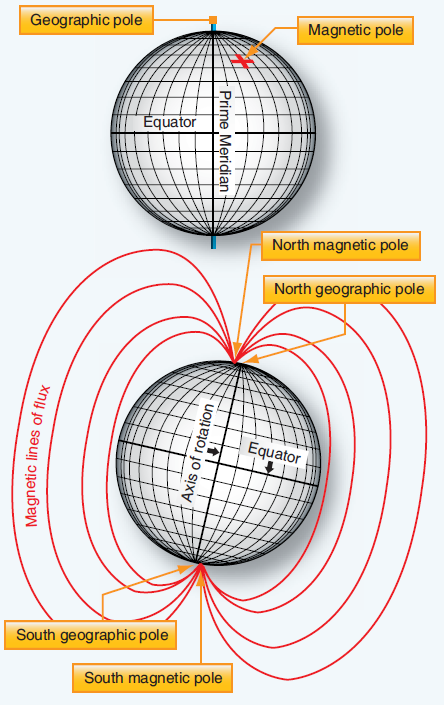 The earth’s magnetic field exits the poles vertically and arches around to extend past the equator horizontally or parallel to the earth’s surface. [Figure 1] Operating an aircraft near the magnetic poles causes what is known as dip error. The compass magnets pull downward toward the pole, rather than horizontally, as is the case near the equator. This downward motion causes inaccuracy in the indication. 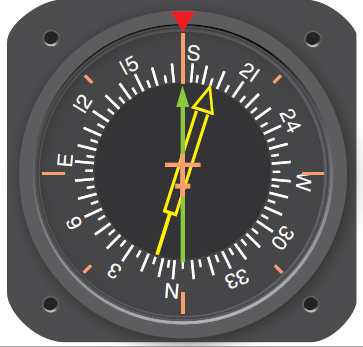 Although the compass float mechanism is weighted to compensate, the closer the aircraft is to the north or south magnetic poles, the more pronounced the errors. Dip errors manifest themselves in two ways. The first is called acceleration error. 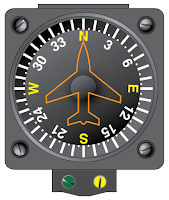 If an aircraft is flying on an east-west path and simply accelerates, the inertia of the float mechanism causes the compass to swing to the north. Rapid deceleration causes it to swing southward. Second, if flying toward the North Pole and a banked turn is made, the downward pull of the magnetic field initially pulls the card away from the direction of the turn. The opposite is true if flying south from the North Pole and a banked turn is initiated. In this case, there is initially a pull of the compass indicator toward the direction of the turn. These kinds of movements are called turning errors. Another peculiarity exists with the magnetic compass that is not dip error. Look again at the magnetic compass in Figure 2. If flying north or toward any indicated heading, turning the aircraft to the left causes a steady decrease in the heading numbers. But, before the turn is made, the numbers to the left on the compass card are actually increasing. The numbers to the right of the lubber line rotate behind it on a left turn. So, the compass card rotates opposite to the direction of the intended turn. This is because, from the pilot’s seat, you are actually looking at the back of the compass card. While not a major problem, it is more intuitive to see the 360° of direction oriented as they are on an aeronautical chart or a hand-held compass. Solutions to the shortcomings of the simple magnetic compass described above have been engineered. The vertical magnetic compass is a variation of the magnetic compass that eliminates the reverse rotation of the compass card just described. By mounting the main indicating magnets of the compass on a shaft rather than a float, through a series of gears, a compass card can be made to turn about a horizontal axis. This allows the numbers for a heading, towards which the pilot wants to turn, to be oriented correctly on the indicating card. In other words, when turning right, increasing numbers are to the right; when turning left, decreasing numbers rotate in from the left. 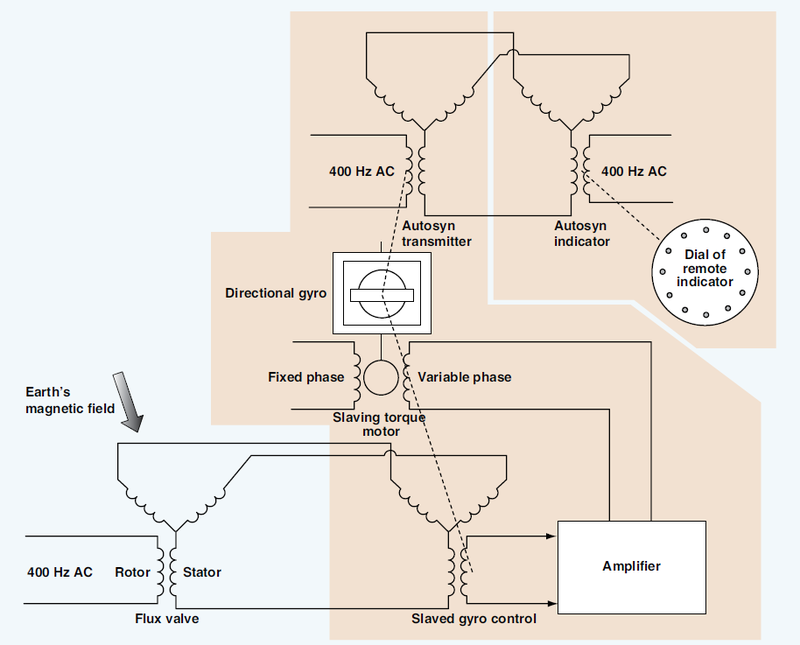 [Figure 4] Many vertical magnetic compasses have also replaced the liquid-filled instrument housing with a dampening cup that uses eddy currents to dampen oscillations. Note that a vertical magnetic compass and a directional gyro look very similar and are often in the lower center position of the instrument panel basic T. Both use the nose of an aircraft as the lubber line against which a rotating compass card is read. Vertical magnetic compasses are characterized by the absence of the hand adjustment knob found on DGs, which is used to align the gyro with a magnetic indication. Magnetic deviation is compensated for by swinging the compass and adjusting compensating magnets in the instrument housing. A better solution to deviation is to remotely locate the magnetic compass in a wing tip or vertical stabilizer where there is very little interference with the earth’s magnetic field. By using a synchro remote indicating system, the magnetic compass float assembly can act as the rotor of the synchro system. As the float mechanism rotates to align with magnetic north in the remotely located compass, a varied electric current can be produced in the transmitter. This alters the magnetic field produced by the coils of the indicator in the cockpit, and a magnetic indication relatively free from deviation is displayed. Many of these systems are of the magnesyn type. An elaborate and very accurate method of direction indication has been developed that combines the use of a gyro, a magnetic compass, and a remote indicating system. It is called the slaved gyro compass or flux gate compass system. The distribution of earth’s magnetic field flowing through the legs is unique for every directional orientation of the aircraft. A coil is placed in the center of the core and is energized by AC current. As the AC flow passes through zero while changing direction, the earth’s magnetic field is allowed to flow through the core. Then, it is blocked or gated as the magnetic field of the core current flow builds to its peak again. 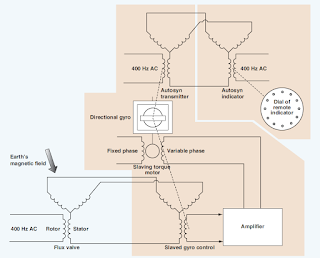 The cycle is repeated at the frequency of the AC supplied to the excitation coil. The result is repeated flow and nonflow of the earth’s flux across the pickup coils. During each cycle, a unique voltage is induced in each of the pickup coils reflecting the orientation of the aircraft in the earth’s magnetic field. Further enhancements to direction finding systems of this type involving the integration of radio navigation aids are common. The radio magnetic indicator (RMI) is one such variation. [Figure 8] In addition to the rotating direction indicator of the slaved gyro compass, it contains two pointers. One indicates the bearing to a very high frequency (VHF) omnidirectional range (VOR) station and the other indicates the bearing to a nondirectional automatic direction finder (ADF) beacon. These and other radio navigation aids are discussed further in the communications and navigation. It should also be noted that integration of slaved gyro direction indicating system information into auto-pilot systems is also possible. A radio magnetic indicator (RMI) combines a slaved gyro heading indication (red triangle at top of gauge) with magnetic bearing information to a VOR station (solid pointer) and an ADF station (hollow pointer).